Size: 43.6″ x 23″ laid flat, 13.5″ center depth, 4″ side depth, 46″ neckline. Comments: A deep frontpiece of English Honiton guipure. Snails/slugs style, starting to break out of that genera. Note the figural birds and butterflies, also well done woven tally leadworks. 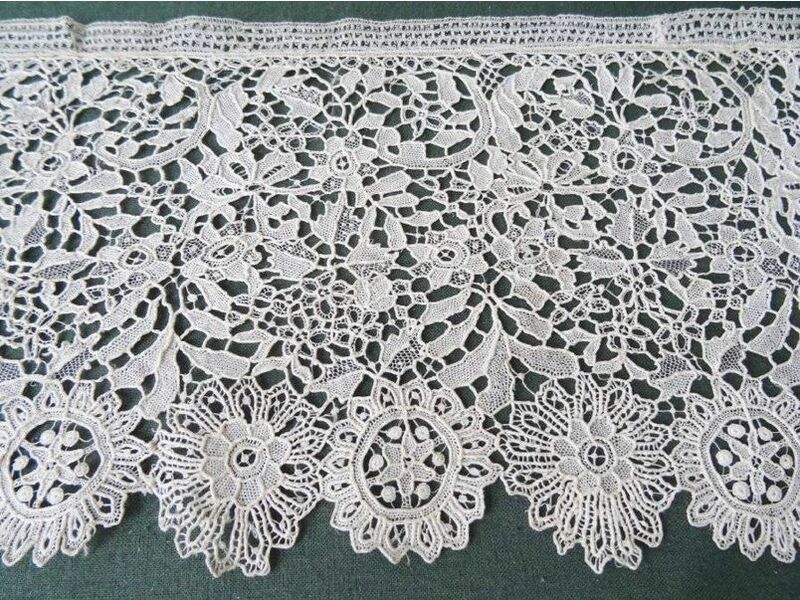 An impressive design of the flower garden ‘hedgerow’ effect so common in this type of lace. Excellent technique. Damage: Seller cites some small breaks. Soilage: Seller cites creamy off white color. Along with some localized light spots and faint tanning. 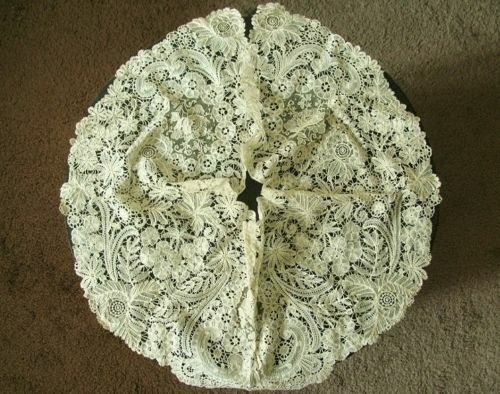 Size: 21″ x 16″ laid flat, 6.75″ center depth, 7″ side depth, 17″ neckline. Comments: An interesting Belgian needlelace frontpiece, both in design and technique. It has a combination of un-grounded work and Point de Gaze inserts without raised work. The clothwork has the same density throughout the whole piece. Extensive decorative ‘mode’ fillings, although they are fairly simple. 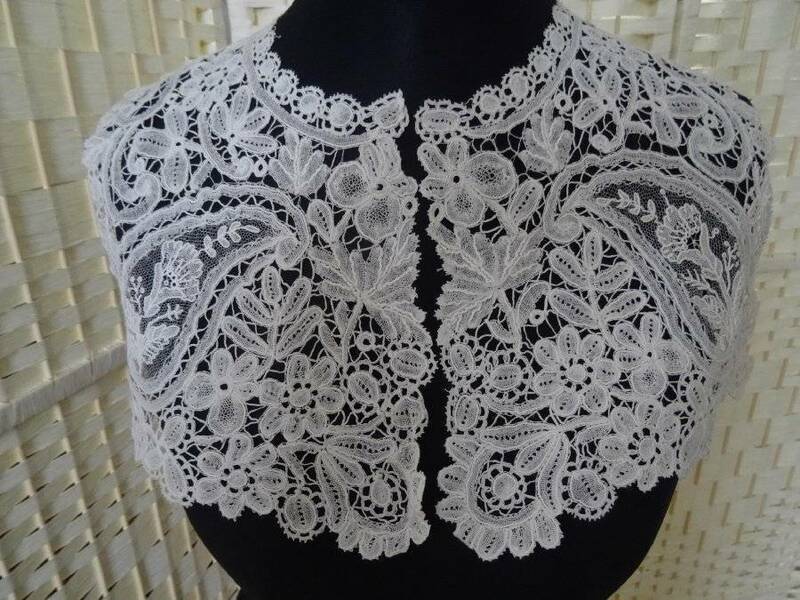 Note the picoted double brides along the neckline, unusual. The design is a bit asymmetric with an Art Nouveau feel. Damage: Small holes in the Pt de Gaze mesh, occasional broken bride. Soilage: Seller cites light cream color. Sold for $78.00, 1 bidder. Comments: A Brussels Duchesse handkerchief, no raised work in the Point de Gaze inserts. Conventional Duchesse motifs, also no raised work other than the veining. Good conventional design. Damage: Occasional separation where the PtdG is attached, along along the cloth attachment. Fixable. PdG mesh looks good. Soilage: Seller notes some age marks in the cloth. Finish: Sold creases and wrinkles, especially in the cloth. Sold for 42.00 GBP, 1 bidder. Size: 38cm wide panel, 38 cm from back to front. Comments: A Brussels Duchesse deep collar or dress front. Raised petal rose in one Point de Gaze insert, other inserts have no raised work. Note the lines of decorative ‘mode’ fillings, nicely done. The Duchesse is a bit on The Bruges Bloemwerk side with fairly large motifs. The scale of all the motifs seems a little large. Damage: Some small holes in the ptG mesh. Some3 brides look like a twisted pair instead of a full 4-plait, wonder if this is original, although it doesn’t interrupt the design. Sold for 64.00 GBP, 2 bidders. Comments: A set of Gros Point style cuffs with a matching choker collar. From some of the clothwork is done I think this might be a French piece. Italy is a possibility, but the stitches don’t look right. Very difficult to tell with these copies, they were made in several places. 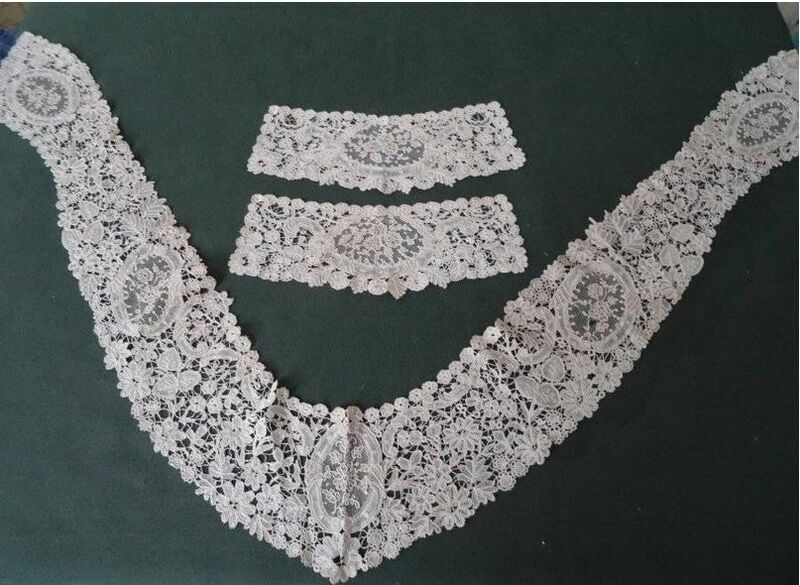 This set has nicely shaped raised work, good filling stitches, but no special ornamentation. 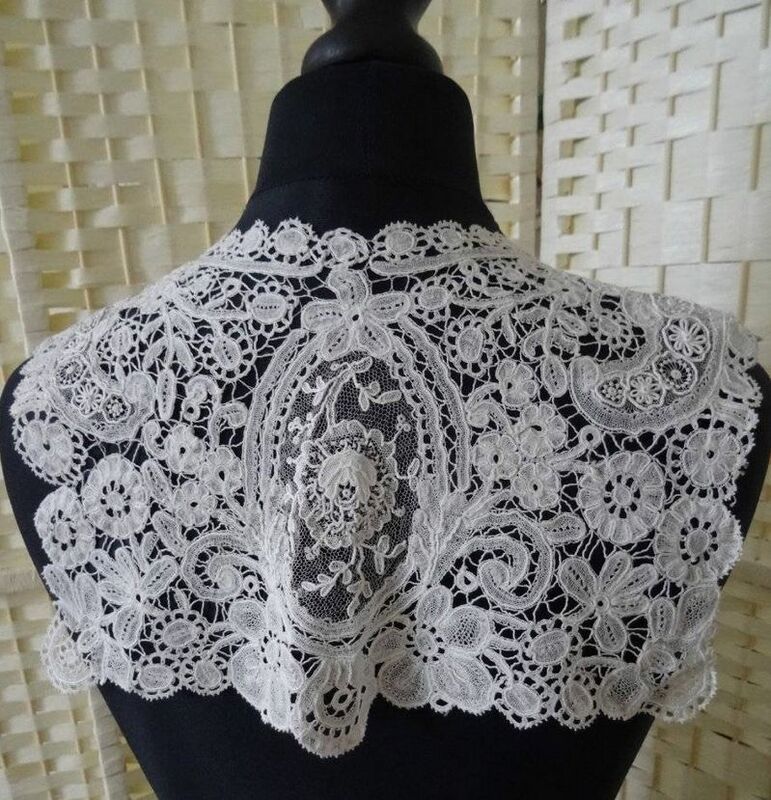 This seller has also listed other excellent items, especially Irish Crochet. Date: 4th quarter 19th c. or early 20th c.
Finish: A few folds along the edges. Sold for 41.00 GBP, 7 bidders. Comments: A s border of Point de Gaze, of a type that I sometimes call ‘guipure’. It has no Point de Gaze Ground, just a few twisted bar connections. You see this come up for sale occasionally. Interesting design, but not particularly sophisticated. Modifications: Can’t see the ends to tell if they are cut. Engrelure added. Sold for 180.99 GBP, 6 bidders. 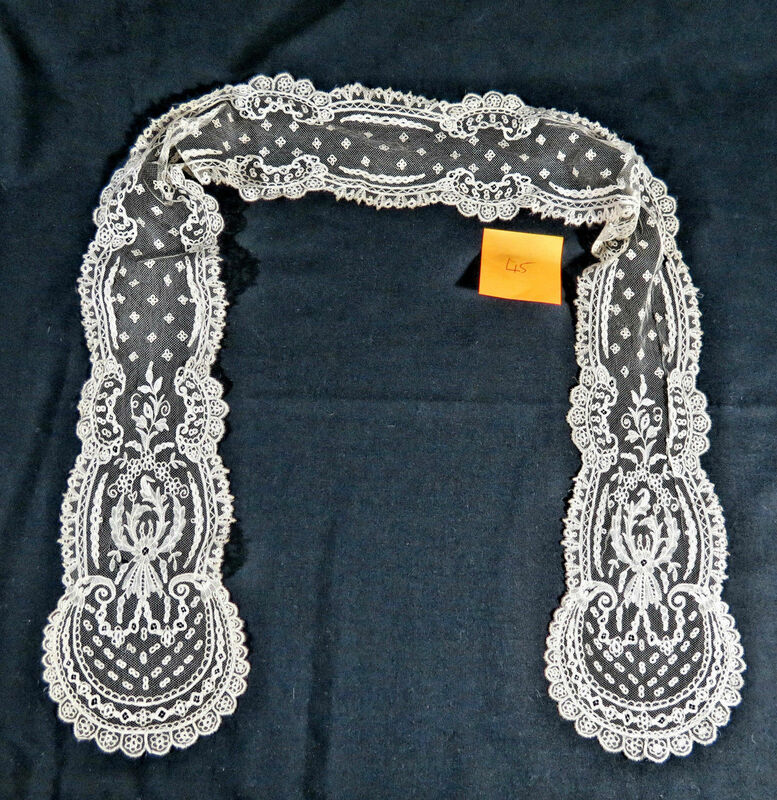 Size: 10 cm x 120 cm, cuffs 23 cm x 8 cm. Comments: A Duchesse de Bruxelles shawl collar and matching cuffs. No raised work in the Point de Gaze inserts, but a little in the strapwork in the bobbinlace. Conventional design, but it’s unusual to find a matching set. Damage: Some pinholes and small holes in the PtdG mesh. Finish: Fold creases, slight wrinkling. Sold for 120.00 GBP, 1 bidder. 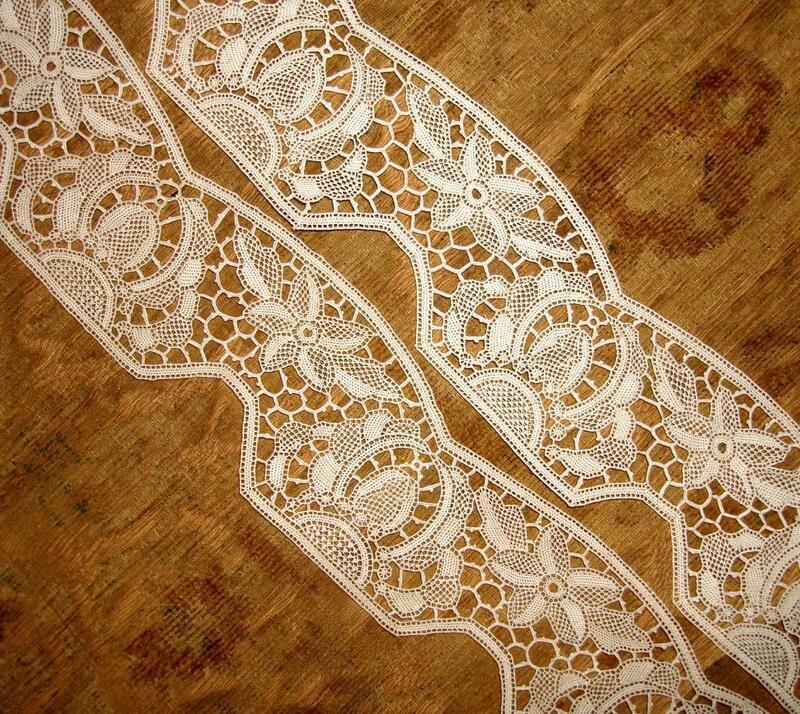 Comments: A lappet scarf of Brussels bobbinlace applique on machine net. Simple leaf design at the ends, and I especially like the quatrafoil designs used as esprits in the main ground. Damage: Some pinholes and a few tiny holes in the tulle. Finish: Some creasing in the tulle. Sold for 33.00 GBP, 10 bidders. 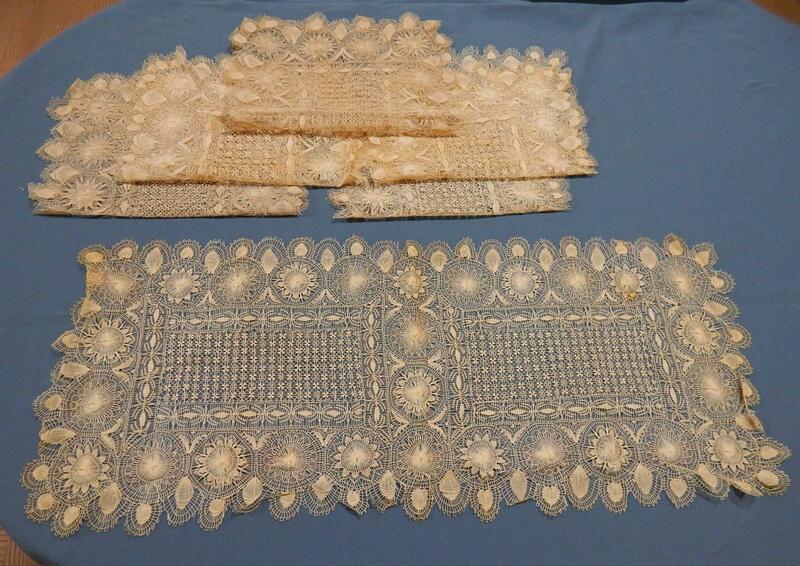 Comments: Please look at all the listings by this seller; I’m showing two photos below from separate posts and only giving information for the bobbinlace. 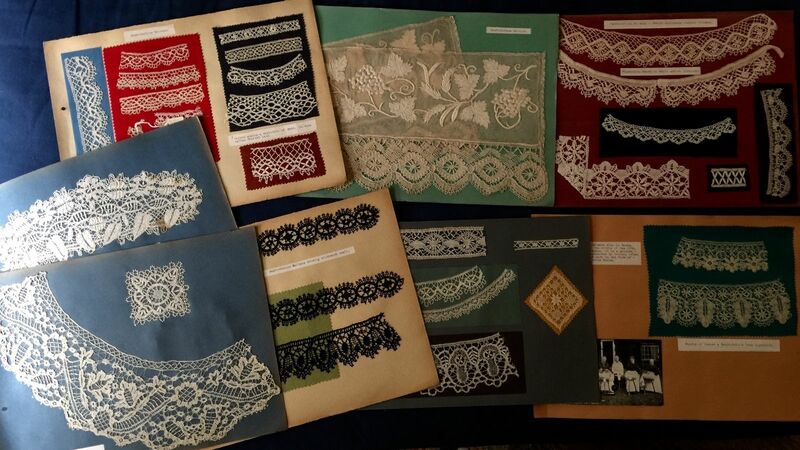 For several weeks this seller has been listing short bobbinlace samples, along with some needlelace. I spoke with the seller who indicates they were purchased as a lot from an antique and vintage haberdashery dealer who specializes in buying up large batches of dead stock in France. They appear to have been part of a sample book at one point because some of them have glue on the backs. They come from the Craponne-Sur-Arzon area, and the bobbinlace looks typical of this area. 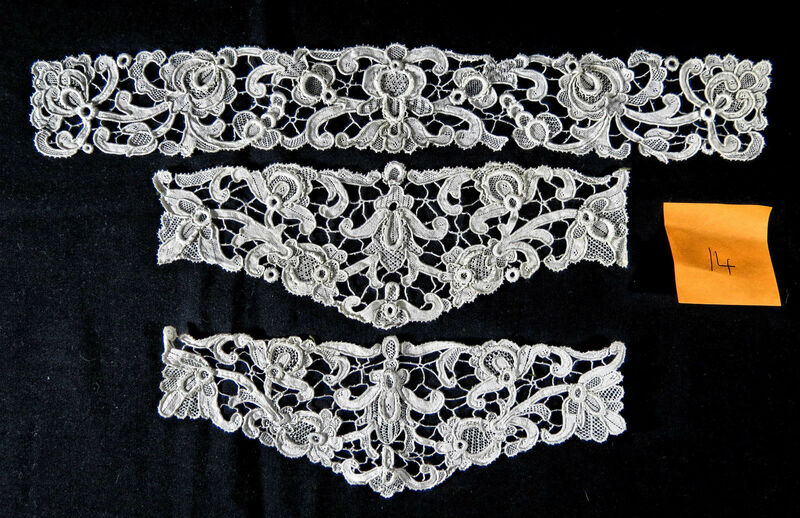 The needlelace samples, however, look very much like Viennese Art Nouveau lace, and were probably imported by the retailer. This is a remarkable collection and is proving quite popular with buyers. Hopefully someone can help identify the manufacturer. Soilage: Some have signs of glue on the back. Sold for 33.00 GBP, 5 bidders. Sold for 24.00 GBP, 4 bidders. Starting Price: $45.00 with reserve. Comments: An oval tablecloth assembled from what looks like earlier pieces. These all appear to be Northern Italian, Milanese. The center part and the scrolling wide border with 5-star ground around the edge are especially impressive. There’s a chance some of it might be Flemish, but I’d like a closer look before making that attribution. Date: 18th c? Assembled in the early 20th c.
$159.30, 5 bidders, reserve not met. 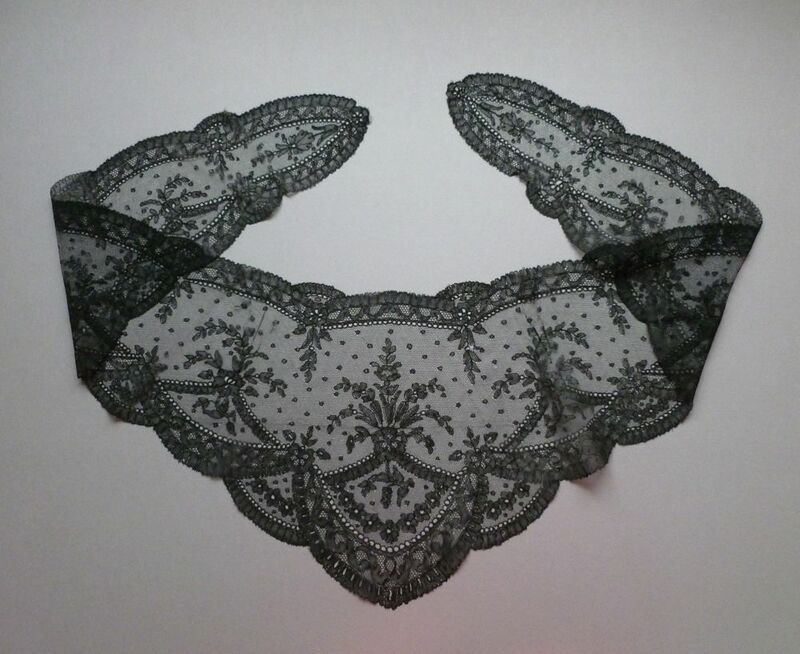 http://tinyurl.com/q6m7nd8 A VICTORIAN HONITON BOBBIN LACE APPLIQUE SHAWL WRAP OR VEIL ON BLACK MACHINE NET. 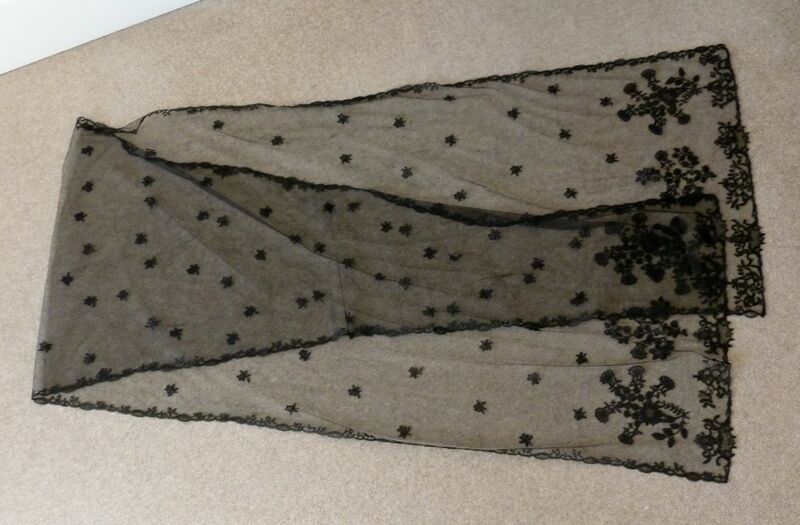 Comments: Black Honiton does come up occasionally – this is a rectangular shawl applique on machine net. Moving away from the snails/slugs stle, with three floral sprays at the ends, esprits of sprigs in the ground, and a fairly narrow border up the sides. Good woven tally leadwork fillings, and the net has been cut from behind some, but not all of them. Damage: Small repairs throughout, occasional pinhole. Sold for 77.30 GBP, 3 bidders. Size: 59″ x 13.5″ at center. 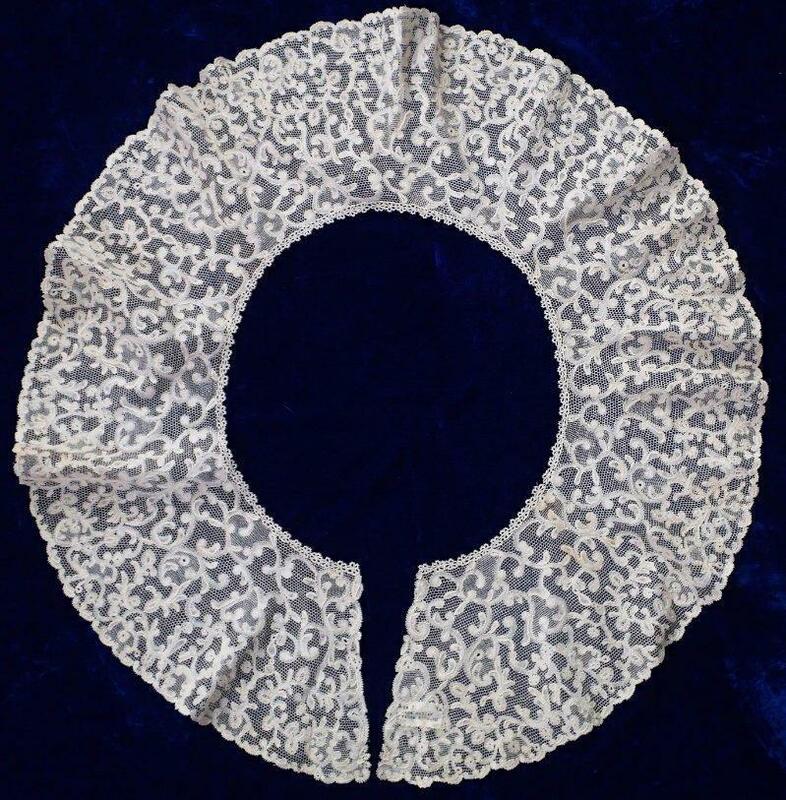 Comments: A fichu collar of Chantilly. Romantic floral elegant design with esprits in the ground. Hard to guess on this one if it is French or Belgian. Damage: Seller cites minor breaks repairs. Finish: Some creasing, or this might just be a few repairs.. 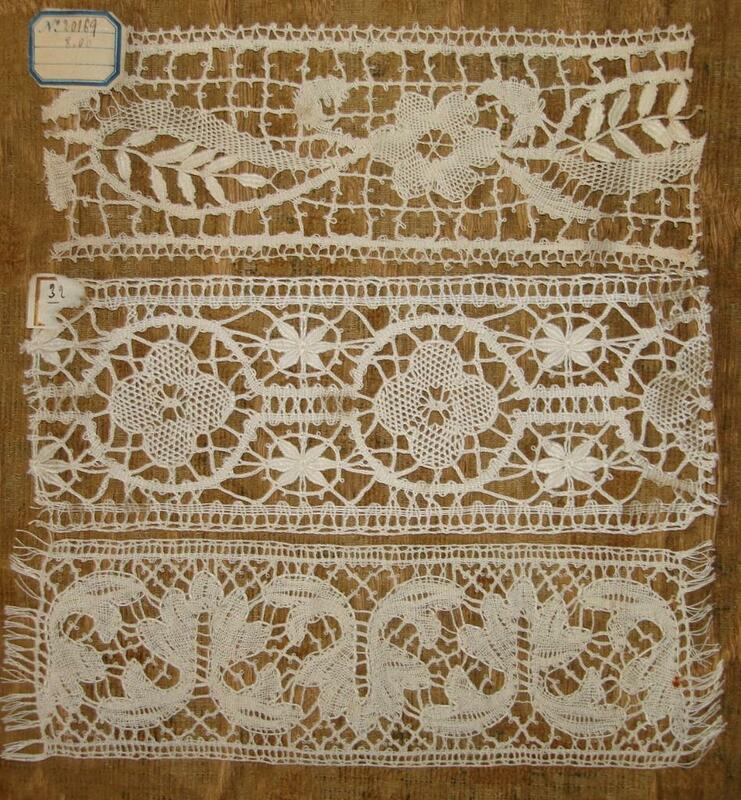 Comments: A narrow shawl of Brussels bobbinlace applique on net – I can’t tell from the photos if it is machine or droschel. I suspect Machine, but would love to have a closer look (if it is droschel it would be a very late example). The design looks a lot like 18th c organization (especially the hexagonal mesh filling), but has a more later 19th c technique. Notably the needle-made decorative fillings. Quite an interesting piece. Damage: Seller cites a few tiny openings. Soilage: Seller cites ‘cream patina’. 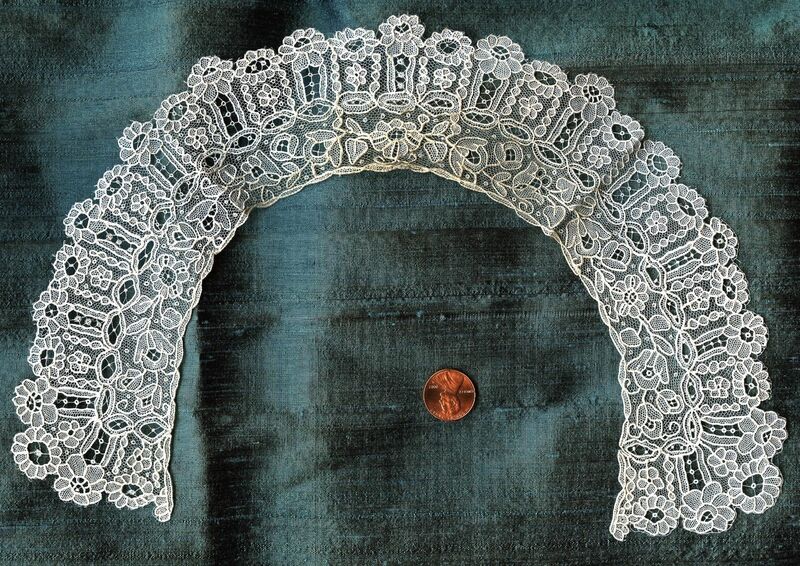 Comments: A bertha collar of Punto de Milan, which is a pieced bobbinlace (Old Flanders) with a needle-made ground. The ground does resemble the Alençon ground, which no doubt accounts for the note on the tag. Nicely organized floral ground with overall fine work. I particularly like the little flowers along the neckline. 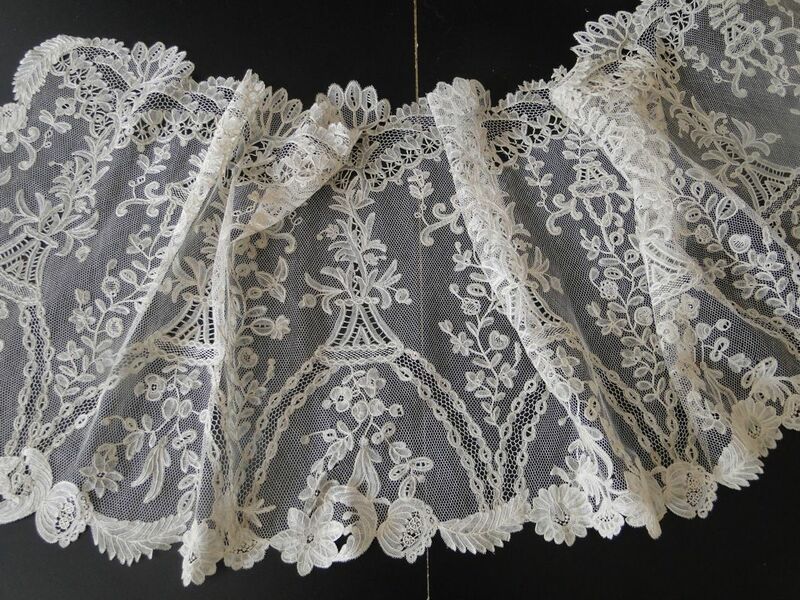 This is a type of lace that often suffers from sloppy technique and coarser threads – not here. Soilage: Some localized light spots. Overall light cream or ivory color. 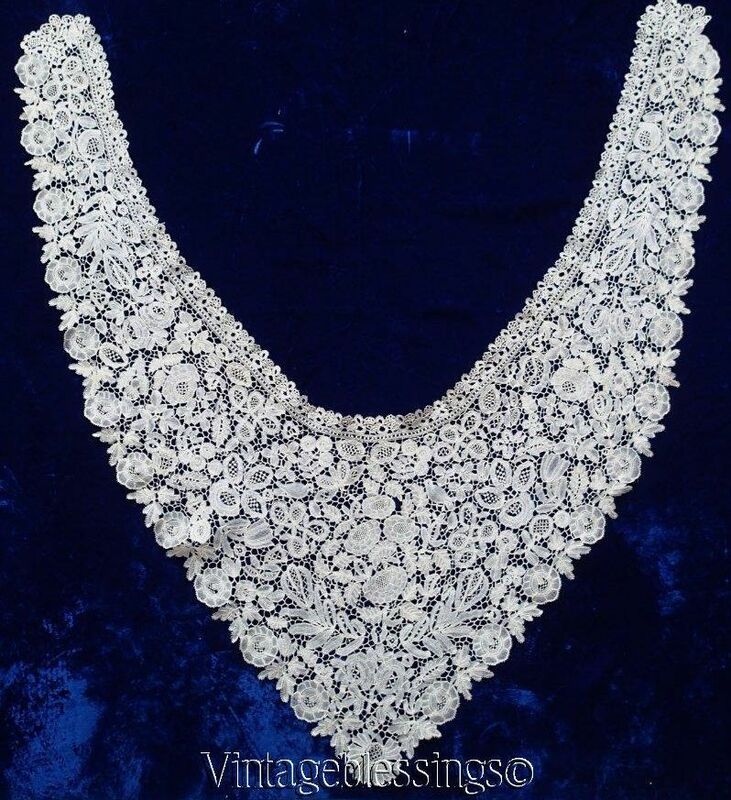 Size: 9″ deep, hard to tell the neckline measurement. Says it first 15″, 16″, 17″ or 18″. Comments: A deep collar of Brussels Duchesse. Raised petal roses in the Point de Gaze inserts, note the petals have small diamond windows – sign of a better manufacturer. Very dense romantic florals with a few decorative ‘mode’ needlelace fillings. A little raised work on the strapwork in the bobbinlaces. 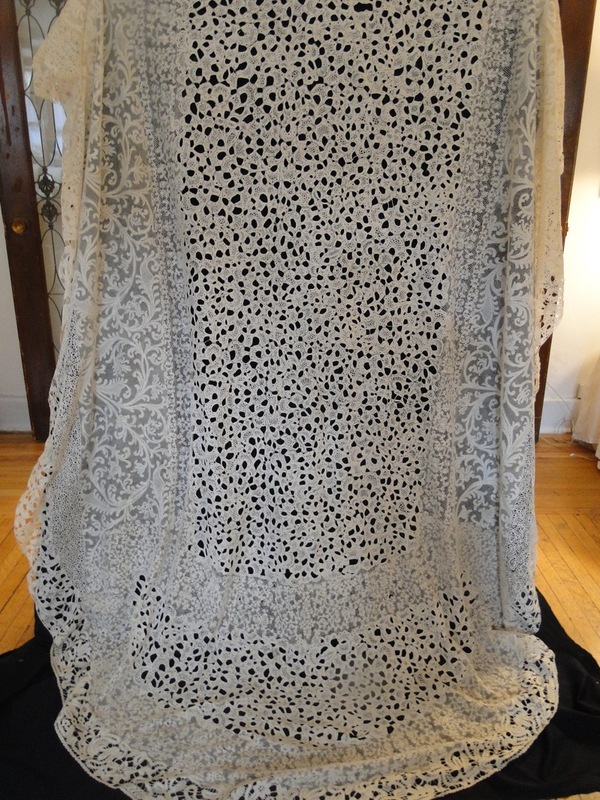 I find the motifs a little large for the size of the piece. Comments: This seller is doing several auctions on pages from this collection. The samples collected are excellent examples of each type. An impressive collection. 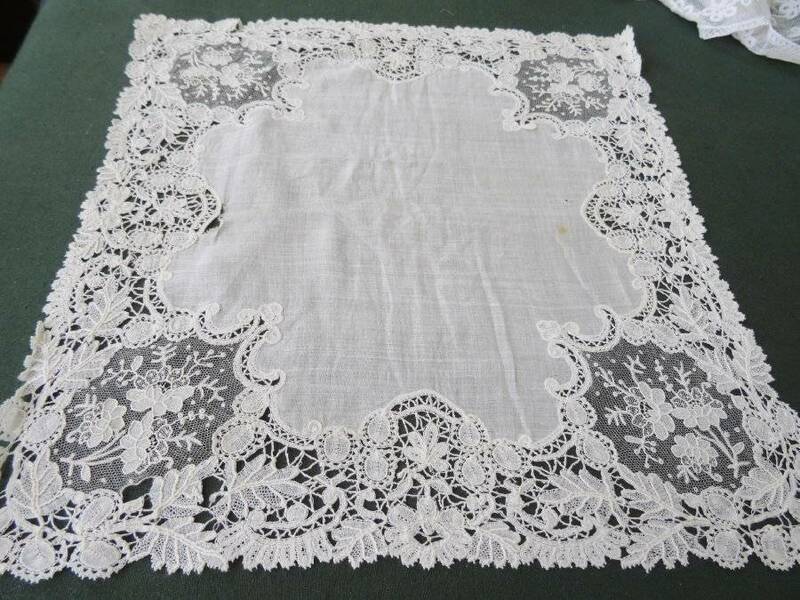 Provenance: Assembled in the 1970’s by an English lacemaker. Modifications: Samples stitched to pages or cloth which is mounted on the pages. Sold for $105.00, 1 bidder. Comments: A set of 5 Ñanduti placemats and one runner. I’m guessing one placemat might be missing. Each has a number of different ‘sol’ motifs with palm leaves around the edge. Center is a grid mat of decorative stitches. I’ve never seen a set like this before. Soilage: Most ivory off white color, 2 placemats more ecru. Some age spots and uneven patina. Sold for $29.00, 1 bidder. Comments: A small round collar of Point de Gaze. No raised work, and very simple rings and knots used as fillings. Note the looped widely spaced picots around the other edge. Good delicate simple design. 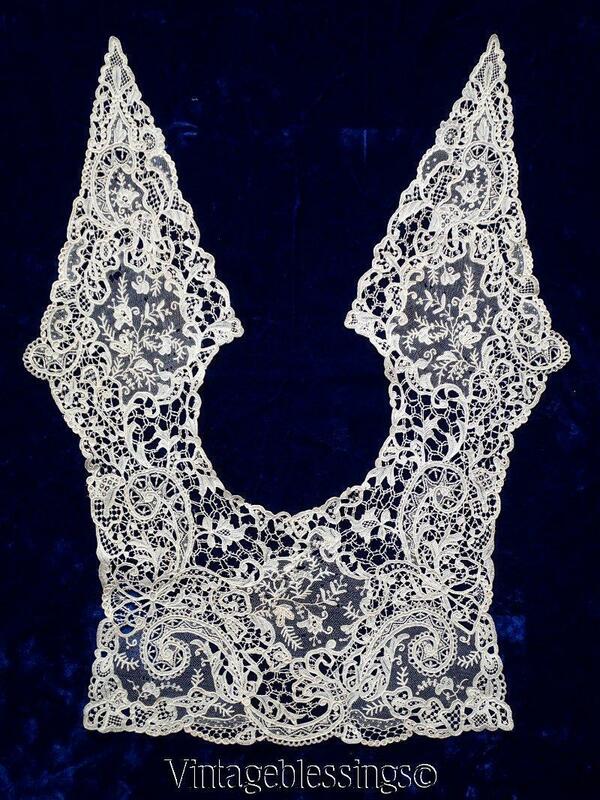 Soilage: Stains around the neckline and a little into the back of the lace collar. 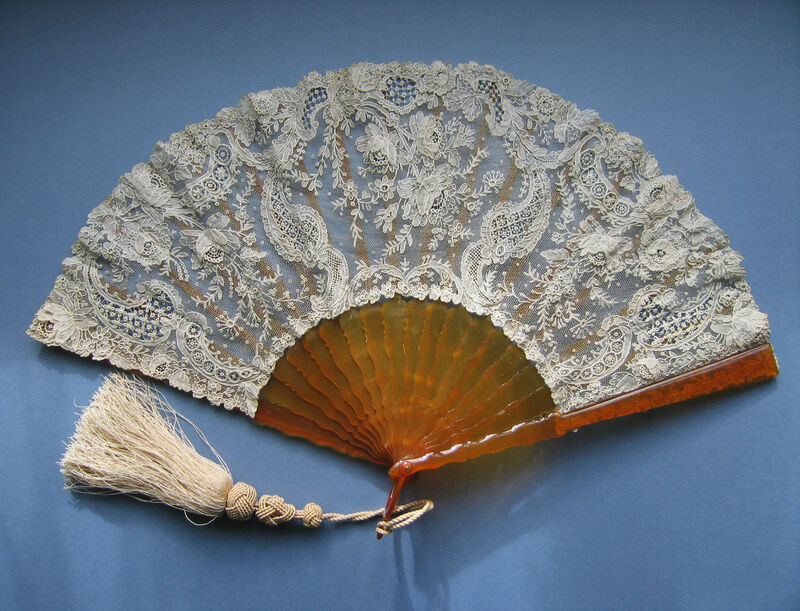 Comments: A Point de Gaze fan with amber sticks and the original tassel. Raised petal roses with diamond windows. The whole piece looks slightly off – the fan leaf doesn’t seem wide enough. But it does not appear to be cut down. Excellent floral design, good decorative ‘mode’ fillings, technically rather sophisticated. Point de Gaze with a lot of raised work throughout may not be the best material for a folding fan, and it does look a little bulky folded up. I also like the sticks with their carved edges. Damage: A few pinholes in the mesh, minor. Soilage: Seller cites off-white shade. Sold for $308.00, 4 bidders.